Realgar, the fifth basic element in China, is a toxic arsenic compound and a much beloved substance of Daoist alchemists, who used small amounts in elixirs in an effort to transcend consciousness and attain immortality. It was also used for medicinal purposes, and realgar wine, brewed with the root of the sweet flag, itself a mind-altering drug, was consumed during the Duanwu Festival. Duanwu symbolized the approach of summer, a period especially prone to the spread of disease, thought to have been preventable by the consumption of the realgar mixture. Objects fashioned from realgar are extremely rare, as the material breaks down upon prolonged exposure to sunlight. Due to its popularity, and fragility, glass copies were made in great quantities in the Imperial workshops. 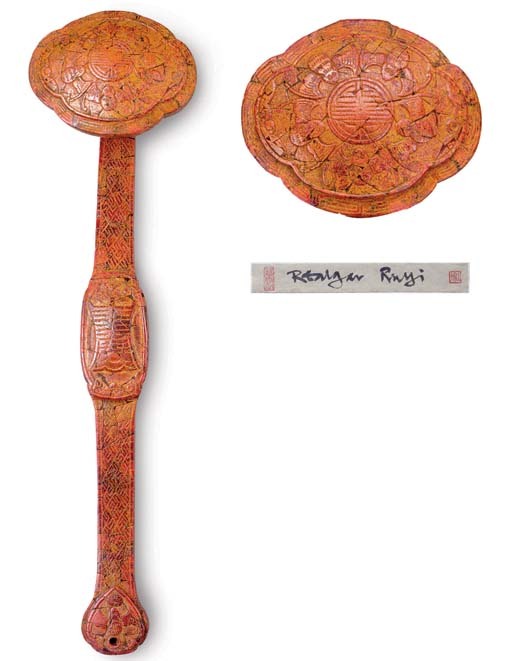 Of the very few extant objects actually made from realgar, the current lot appears to be the only known example of a ruyi scepter. It also appears to be the largest surviving work made from the material, with the majority of examples fashioned from single pieces of much smaller size. The choice of material is especially well-suited as the ruyi is itself a symbol of longevity.